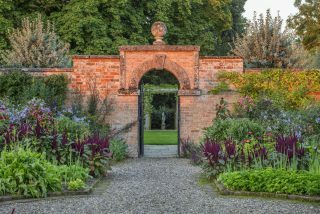 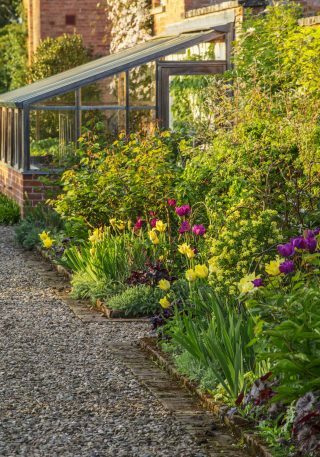 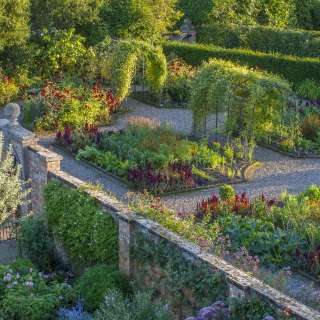 Through an old brick archway and wrought iron gate, the drama of the Kitchen Garden unfolds. 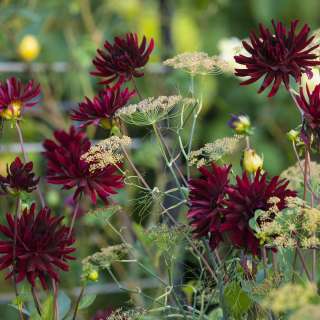 This is all about contrast in structure and colour. 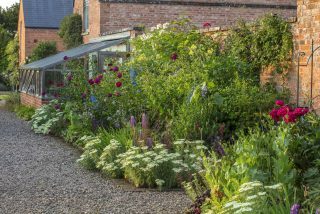 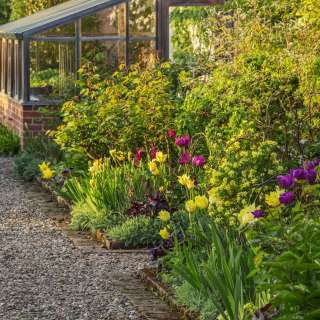 Wide gravel paths edged by York brick define rectangular borders in front of high boundary walls and enclose half-moon beds in the centre. 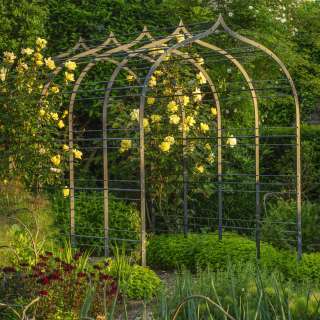 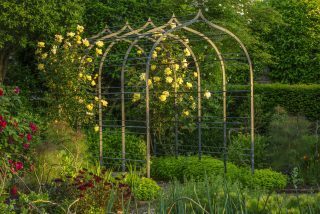 A path runs down a central axis of wrought iron tunnels and arches, covered in Clematis orientalis and roses. 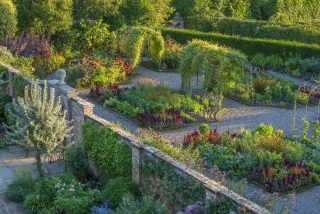 The central beds are planted with seasonal vegetables and ornamentals, while the perimeter borders host a mix of shrubs and herbaceous plants. 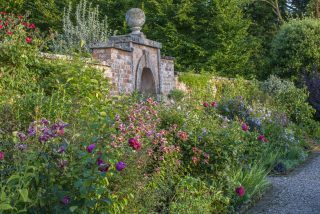 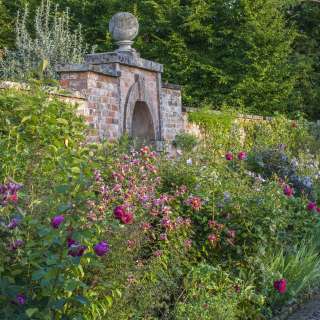 The planting style of the ornamental borders is similar to the South Garden, with an emphasis on roses and clematis. 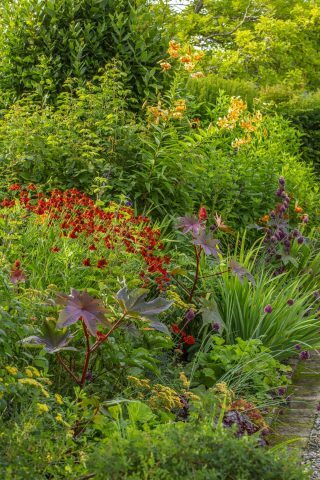 However, in contrast to the soft palette of the South Garden, the colour scheme is flamboyant and dominated by complementary colours. 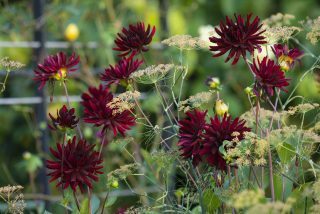 The display is most dramatic from mid-summer onwards, contrasting the ripening vegetables and it continues well into the autumn with massive spires of aconites, asters and eupatoriums. 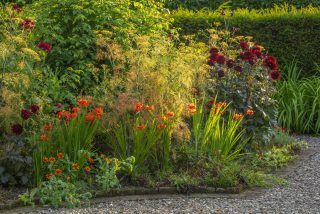 Following the path of the sun, the colours change during the day, from softer morning magentas, light blues, soft pinks and primrose yellows in the east-facing ‘Sunrise borders’ to brilliant reds, bright yellows and blazing oranges in the south-facing ‘Midday borders’ and, finally, burnt hues, golden yellows and dark purples in the west-facing ‘Sunset borders’. 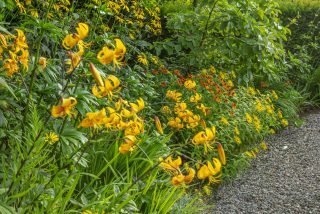 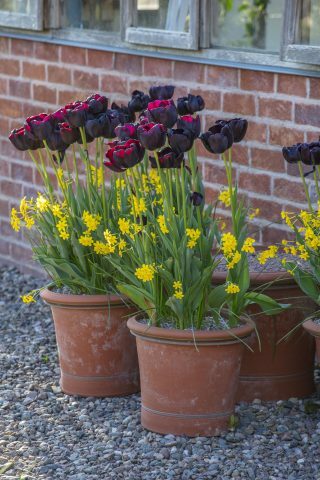 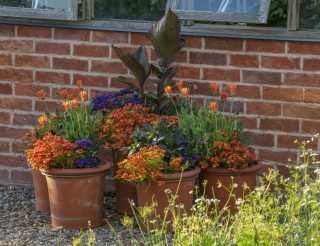 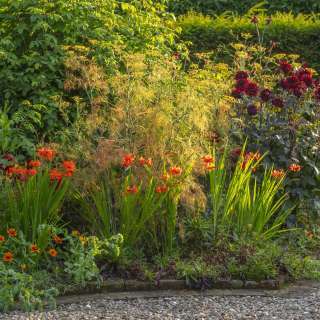 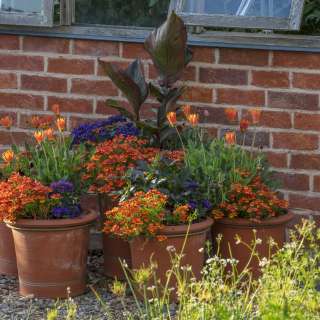 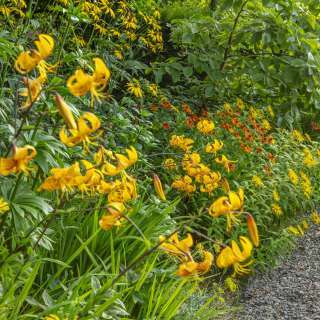 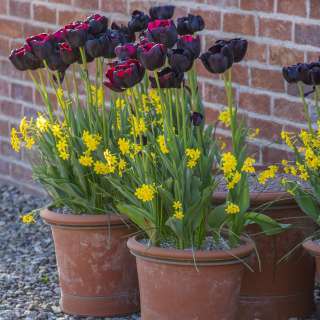 The shapes are more flamboyant and varied too: a succession of tulips, irises, peonies, roses, crocosmia, lilies, hemerocallis, helianthus, rudbeckias, dahlias and heleniums, against a backdrop of purple cotinus and heuchera foliage. 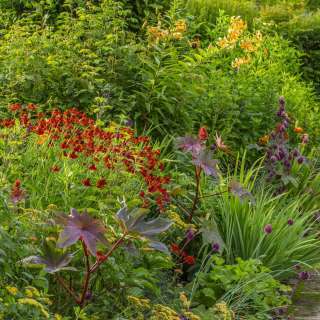 Dotted throughout are tender salvias and cosmos that add softness to the dramatic display. 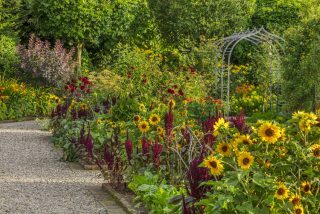 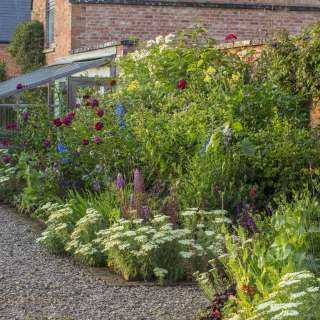 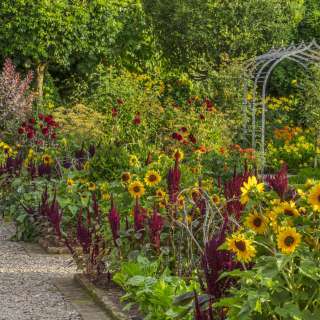 In the eight corners of the central beds, playful mini “hedges” of dwarf amaranthus are filled with sunflowers and zinnias, adding colour and interest to the productive part of the garden.